Do you have a secret government clearance or want to pretend you do? Maybe you’re a little on the paranoid side? Whatever the reason, guarding your data has never been easier with secure flash drives. While I wonder how safe these really are I have to admit that some of the protection offered is quite convincing. IronKey: The World’s Most Secure Flash Drive? First there’s plain password protection. Then there can be data encryption usually ranging from 128 bit to government standard 256 bit algorithms. Most secure memory sticks generate them with internal software and can always be increased through an additional program. Some however are actually hardware based which make it the safer option. In this case the encryption works from a cryptochip meaning no keys are ever leaked or stored on the host machine. Moving to the outside of USB security we have locks. 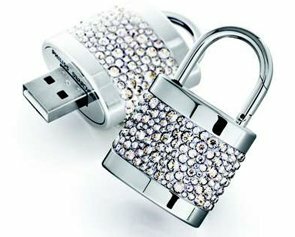 Be aware that we’re talking pin-locks here and not padlock shaped flash drives which only look safe. How to tell the difference? Well, if you can program your lock with a number combination you’re on. However, if that’s not safe enough for you or you tend to forget your PIN-numbers you can opt for a true thumb drive: one with biometric fingerprinting. You simply record your fingerprint with the included software and voila, every time there’s a match the data gets unlocked. You only have to hope that there’s no clone of yours running around or that the USB port is unreachable. Still on the outside, let us consider the casing of memory sticks which ensures safety in a more physical sense. There’s titanium alloys or aluminum shells which are guaranteed shock resistant and can be water- or bullet proof. So next time you go on a secret mission recovering missiles from a sunken ship you can take along your rugged flash drive. Last but not least, I have to mention the self-destruct feature. 10 times or more the wrong password and boom! – there’s goes your drive in a flash. No, not the physical stick but everything inside. No data whatsoever will be left. Now, if you thought I was kidding about agents and government clearances think again. Beware Lexar Jump Drive Secure II Plus does not work with Windows7 64bit. what exactly was the problem caused on your computer? According to the Windows 7 compatibility center the Lexar Jump Drive Secure II plus should work without any action required. Would be interesting to hear if others have issues with this model too…. 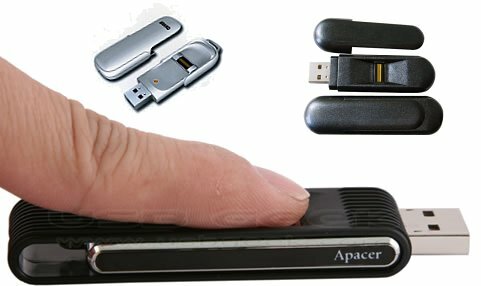 The flash drive with biometric authentication is pretty neat and it does not cost much. I need to get me one of those. can a password be required to open a memory stick ? in addition to finger print or 2 fingerprints? yes, many secure flash drives have that feature. Password protection on top of biometric security. Some even have a master password.